In his only known moment of weakness, Auri-El agreed to take his part in the creation of the mortal plane, that act which forever sundered the elves from the spirit worlds of eternity. Auri-El and the other gods of the Aldmer were disgusted by their enfeebled selves and what they had created, and insisted that everything was permanently spoiled, and all they would be able to do would be to teach the elves to suffer with dignity. To make up for his error, Auri-El led the original Aldmer against the armies of Lorkhan in mythic times, vanquishing him and establishing the first kingdoms of the Aldmer, Altmora and Old Ehlnofey. Auriel's Bow and Auriel's Shield were allegedly created by Anuiel to be used by Auri-El against Lorkhan's hordes. Though Altmora was retaken by men and Old Ehlnofey was sundered, Auri-El's greatest knight, Trinimac (who, in some places, was even more popular than Auri-El), succeeded in defeating Lorkhan, and Auri-El hid his Heart by attaching it to an arrow and sending it far into the sea. Later, Auri-El ascended to heaven in full observance of his followers so that they might learn the steps needed to escape the mortal plane. Many Snow Elves had one great desire: to become one with Auri-El. They built the Chantry of Auri-El in the western mountains of modern-day Skyrim so that they could pursue a pilgrimage of spiritual discovery and ascend into the heavens. They would recite the mantras of Auri-El at several wayshrines, meditating on their lessons, before journeying to the Inner Sanctum to ostensibly become one with their god. ^ Auri-El was evidently a prominent figure in the Ayleid religion. 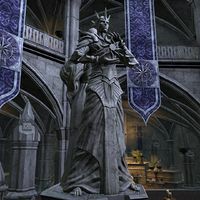 In the Oblivion quest Secrets of the Ayleids, the Altmer Umbacano gains access to an Ayleid throne by reciting "Av Auri-El ye Tamri-El dellevoy an Arpen Aran tarnabye! ", which means "By Auriel and Tamriel, grant [imperative] [the] Noble [ie, True] King passage." 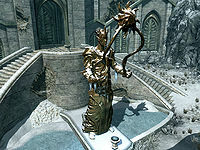 In the Dawnguard add-on for Skyrim, Serana notes that the statue of Auri-El outside the Inner Sanctum of the Chantry of Auri-El incorporates the "older signs" of his power. Legends say Auri-El despises Orcs, and that his scribe was Xarxes. Saint Alessia is sometimes referred to as Auri-El's wife. 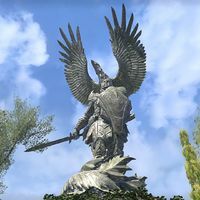 For related information, see entries for Akatosh, Alkosh, and Alduin. ^ Knight-Paladin Gelebor's dialogue in Skyrim. This page was last modified on 23 October 2018, at 12:29.